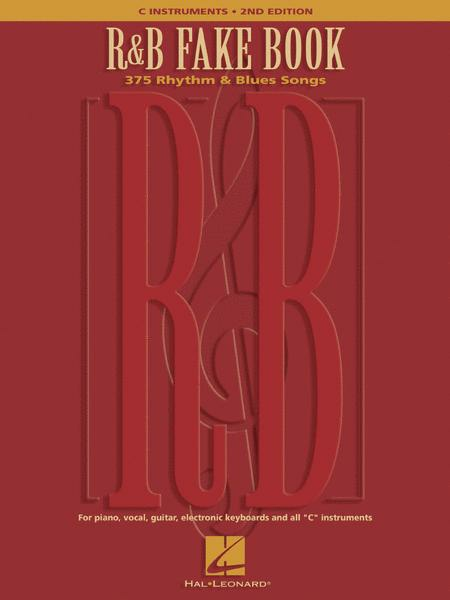 375 Rhythm & Blues Songs. By Various. Hal Leonard Fake Books. R&B and Classic Soul. Fake book. With vocal melody, lyrics and chord names. 437 pages. Published by Hal Leonard (HL.240107). 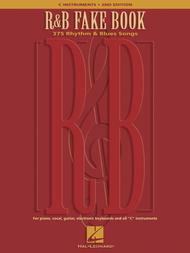 This awesome R&B fake book features melody lines, lyrics and chords for 375 classics, including 125 songs added to the 2nd edition. A "fake book" contains songs written in a concise format that includes only the melody and chords, letting you interpret the song's performance as you feel is appropriate. This is great for quickly learning songs by yourself or with an ensemble. Each song in a fake book only has a single melody actually written out in notes, which is usually the vocal or lead melody. This melody will have the lyrics written beneath the notes, with each word aligned to its corresponding note. Above the notes of the melody will appear the names of the appropriate chords to play - for example, a "C minor" chord would be written as "Cmin" or Cm", rather than writing out all of the notes in those chords as they appeared in the original version of the song. This format is very compact, which is why you will often see fakebooks containing 500 or more songs. I enjoy the variety of songs. Some I don't know but are interested in learning. I sing at a piano bar. I buy a lot of books and this one has sooooo many I could use. It has a good share of upbeat songs also. 42 of 94 people found this review helpful. The book worth the investment. I see a lot of great songs in it. i think a beginner can use it as well. 39 of 90 people found this review helpful. An excellent resource but being very old school there are songs that could be added like here i go again by smokey robinson and the miracles. Songs by the stylistics and o jays,delphonics. Overall a great fake book. 45 of 83 people found this review helpful. Bare-bones melody and chord symbols. No help with any bass, piano, or rhythm figures to indicate the feel. Leaves out crucial sections on some songs. This book seems like a lazy effort even for a fake book. 53 of 99 people found this review helpful. 42 of 88 people found this review helpful.